Everything you need to know about the Royal Wedding of Meghan Markle and Prince Harry! Prince Harry - the world's most eligible bachelor - and Hollywood starlet Meghan Markle are all set to tie the knot in Spring 2018. Hundreds will attend, millions will watch on television, which means the world is officially on royal wedding watch. Here's every possible thing (down to the tiniest detail) you need to know about their upcoming ceremony. Let's start with the simplest one. Who's getting married? Prince Henry Charles Albert David of Wales, 33, is getting married to Rachel Meghan Markle, 36. Prince Harry is the second son of Prince Charles and the late Princess Diana of Wales. Whereas, Meghan Markle, is an American actress best known for playing Rachel Zane in the still-running legal-intrigue drama ‘Suits’. 12 p.m. on Saturday, May 19, in St. George's Chapel at Windsor Castle. The couple’s decision to wed on a Saturday goes against tradition, as royal weddings usually take place on a weekday. The Duke and Duchess of Cambridge wed on a Friday and the Queen on a Thursday. Is that near Buckingham Palace? Nope. Buckingham Palace is in London. Windsor Castle is in Windsor, a picturesque old town some 20 miles west of London. Windsor is also known for its proximity to Eton College, which is the private high school Harry and William attended. Queen ELizabeth II is in charge, so did she give her permission? Yes, she did because anyone who is among the six people who are next in line to the Crown must receive the queen’s permission to get married! Can you go to the wedding? Nope. Unless you're one of the 1,200 personal guests who get to sit in the chapel, or among the 2,640 additional people (including members of the royal household and "regular" people who work for charities, community organizations) who have been invited to stand on the grounds of Windsor Castle to watch the wedding party, enter and leave. Did the invitations go out already? Yeah they did on March 22, to the first 600 guests of the Royal couple. The invitation ink was American, the card stock was English and the invitations were printed by Barnard and Westwood. What if you lose your invitation? 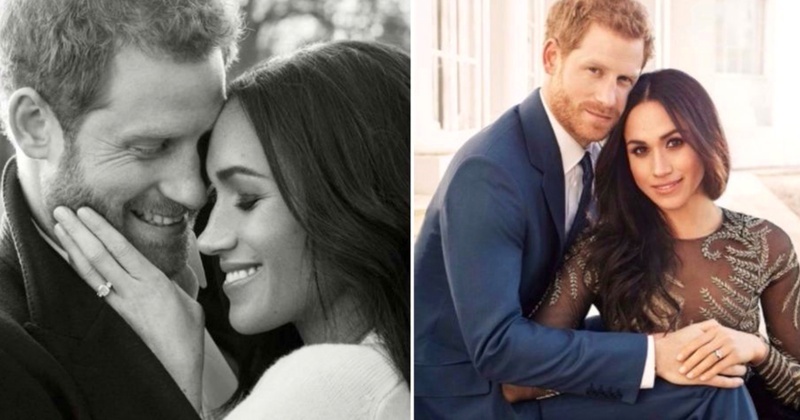 Don’t you fret at all as you can still congregate around Windsor with the other non-invitees eager to catch a glimpse of the couple as they process through the streets in a carriage beginning at 1 p.m. local time. ...or you can also watch it from the comfort of your home! Yes, like always the royal wedding will be televised and live-streamed, but details have not yet been announced. What does the guest list look like? While the guest list is kept very private, there are still a number of predictable attendees: Harry’s grandparents - Queen Elizabeth II and Prince Philip; his father and stepmother - Prince Charles and Camilla, the Duchess of Cornwall; various cousins, like Zara and Peter Phillips and Princesses Eugenie and Beatrice; and of course his brother and sister-in-law, William and Kate, the Duke and Duchess of Cambridge. As for non royals, Harry has a posse — Guy Pelly, Tom Inskip and Thomas van Straubenzee! Meanwhile, Meghan has her own family — her parents, who are divorced but are both expected to attend and a number of famous friends, including Serena Williams; Priyanka Chopra; Sarah Rafferty, and Millie Mackintosh. P.S: Victoria Beckham essentially confirmed that she is attending. Also, Donald Trump is not going to be attending the Royal Wedding. Neither is Barack Obama a very close pal to Prince Harry or Michelle for that matter. According to the invitations, men are supposed to wear uniforms, morning coats or lounge suits, by which they mean, essentially, business suits. Ladies on the other hand are expected to wear ‘day dresses’ — dresses that aren’t evening gowns — and hats. Did Megan have a bachelorette party? It’s rumored that she had a spa-themed “hen do” (that’s British for “bachelorette party”) at the Soho Farmhouse, which is a countryside arm of the members-only Soho House, in March. Her mother, Doria Loyce Ragland is a social worker and yoga instructor who lives in California. Her father, Thomas Markle, Sr., is a lighting director who worked in California for years but now lives in Mexico. Who will design the wedding dress? That’s one of the most frequently asked question. It’s because it is one of the most prestigious commissions in the British fashion and guarantees a grand global exposure. Although, it’s identity will be kept secret until the last moment, but it’s rumoured that it can be Ralph and Russo owing to her engagement picture dress. Harry is the ceremonial head of the Royal Marines and officer in the Blues and Royals, part of the Army Air corps. So, he may wear one of the that uniforms or a morning suit! What about the floral arrangements? Floral designer Philippa Craddock will oversee a team of florists to create the church and reception decorations for the wedding using "locally sourced foliage" and plants that are in season and will be blooming naturally in May. Will there be official wedding photos? Fashion photographer Alexi Lubomirski, who took the couple's engagement photos, will shoot Prince Harry and Meghan Markle's official wedding photographs at Windsor Castle after the ceremony. Will there be a nod to Prince Harry's military career? Yes — more than 250 members of the Armed Forces from "regiments and units that hold a special relationship with Prince Harry" will provide ceremonial support at the wedding and during the carriage procession. The queen will host a luncheon for the 600 guests at St. George's Hall at Windsor Castle following the ceremony and the couple's carriage ride through Windsor Town. The royal wedding cake will be a "lemon elderflower cake to incorporate the bright flavours of spring ... covered with buttercream and decorated with fresh flowers," baked by London-based American baker Claire Ptak. What about the after party? Of course — Prince Charles is going to host a reception at Frogmore House for around 200 guests. Is there a wedding registry? Harry and Markle picked seven charities that have a special meaning to them and asked that people give donations instead of sending gifts. What about the wedding bling? Meghan Markle's engagement ring is made of yellow gold featuring a diamond from Botswana and two diamonds from Princess Diana's collection. And, as per royal tradition, her wedding band will probably be made out of Welsh gold. Is Meghan giving up her acting career? Yeah. Although, she says “I don’t see it as giving up on anything, I just see it as a change. It’s a new chapter and now it’s time to work as a team with Harry”. Meghan Markle was already married, what did that look like? Meghan Markle wore a strapless floor-length gown when she married ex-husband Trevor Engelson in Jamaica on Sept. 10. 2011. Last but not the least, does this royal wedding really matter? To the future of the monarchy and the British economy and the Commonwealth? - probably not, but a biracial American divorcée marrying into the royal family is certainly notable. Why? Because divorce and remarriage was previously forbidden in the Church of England. Off you go Meghan, marrying a prince REALLY! I literally can’t contain my excitement with the whole Royal wedding fiasco - what dress, what makeup, guestlist, the wedding cake ahh! I’ll be back when I have more information on it!